Put another way, that's double the initial estimate. Only a few days ago did we bring you a pair of images showing the last LaFerrari Aperta. Ferrari has made it clear no more examples will be built, capping off production at 210 examples. This final open top LaFerrari, unlike the other examples, was sold at auction yesterday for $9.9 million, or 8,300,000 euros. This exceeded expectations (more like doubled), which conservatively estimated the car would bring in somewhere between 3,000,000 to 4,000,000 euros. This sale eclipses the $7 million paid last December for the last LaFerrari coupe. The auction itself was a very special event. 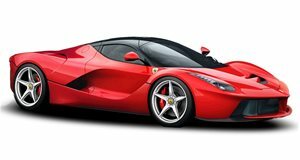 The "Leggenda e Passione" auction, organized by RM Sotheby’s, took place at Ferrari’s very own Fiorano test track, and all proceeds from the sale of this LaFerrari Aperta are being donated to Save the Children, an international program that focuses on education. The metallic Rosso Fuoco-painted Ferrari, shockingly, wasn’t even on display during the auction. It’ll be revealed shortly, but clearly its absence didn’t stop anxious bidders. Other unique touches it features are a metallic Bianco Italia double racing stripe on the hood and rear, a black Alcantara interior with black carbon fiber and red leather inserts on the seats and red stitching. The identity of the buyer, however, remains unknown.